I'd like to announce my new Etsy shop. I hope you will stop by and check it out. The fishnets were done by creating a layer mask for the the fishnet and using that to create a vinyl stencil. The vinyl stencil was layed onto the painting. After removing the positive area of the stencil a layer of paint was applied over the stencil. The color of the paint was a base color of the fishnets. After drying, I remove the stencil. The stencil wasn’t perfect, so I managed to scrape away the excess without damaging the painting underneath. At this point, I stippled in the fine colors of the fishnets, using a few variations. I began using an oil ground a few years ago. This is a great extra step in the painting process. The gesso isn’t absorbing the paints and the colors stay bright, so I’m told. 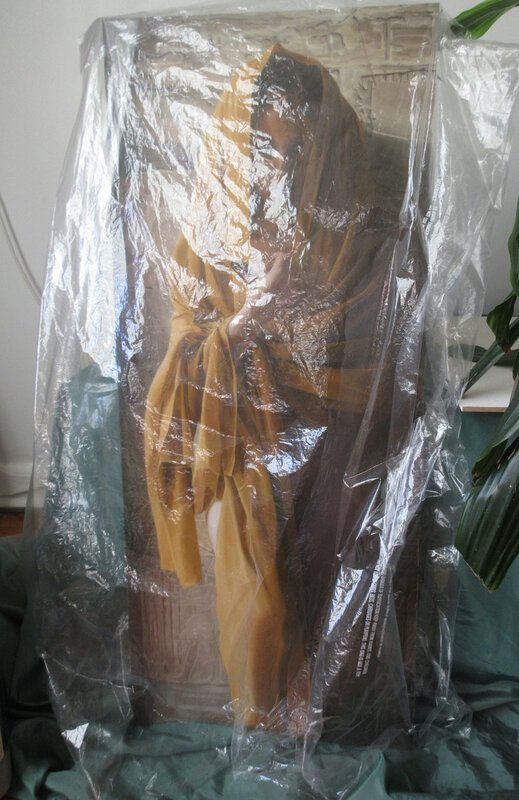 Instead of throwing out those dry cleaning bags, how about using the as dust covers for your smaller paintings. I just got my new shipment of artist panelsFrom Ampersand. This will keep me busy for a while. Thanks for the quality work at Ampersand. Welcome to my blog, time to get involved. I used my postcard design as a cover to my website. The 3 images are in the primary colors, a coincidence. The 3 paintings contain landscapes from different parts of the world.